If I said "Arnold Schwarzenegger Zombie Movie" what would you think? That it would make a great name for an alternative band? That it would make perfect sense as Schwarzenegger is already zombie-like in every movie that he's made? That it's about time that we saw Arnie on-screen blowing away the living dead with a big machine gun? What if I told you that the movie in question, Maggie, is actually a quiet family drama which features Schwarzenegger in an actual acting role? Would that blow your mind? As Maggie opens, we are taken to a world which has been overrun by a plague which not only infects crops (rendering them unusable to the point that they must be burned), but also causes humans to take on a pallid look and develop a taste for flesh. Wade Vogel (Arnold Schwarzenegger) is scouring the city looking for his daughter, Maggie (Abigail Breslin). He learns that she has been taken to a hospital and placed in quarantine, which is common for the infected. Wade is friends with the doctor (Jodie Moore), who allows him to take Maggie home. They arrive at their farmhouse, where Wade lives with his wife, Caroline (Joely Richardson). They attempt to make Maggie comfortable, but the reality is out there -- her condition is going to continue to deteriorate and she will have to return to the hospital. Despite warnings from local law enforcement, Wade is determined to keep his little girl. Over the past decade-plus, we've seen the zombie genre not only rise from the dead (pun intended), but explode to the point that it's overtaken never every corner of entertainment. In that time, we've seen many takes on the idea and in many forms. From the deadly serious (Dawn of the Dead, World War Z) to the slapstick (Life After Beth, Shaun of the Dead), even to teen romance (Warm Bodies), zombies have appeared in many movies and it's clear that filmmakers have made an effort to put a different spin on these monsters. And, of course, The Walking Dead, despite having no original ideas, has brought zombies to the masses and made them something that suburban moms now discuss. Having said that, if you ask some (present company included), zombies may have worn out their welcome. That's why Maggie comes across as such as breath of fresh air. This movie is not concerned with zombie gut-munching action. It's not concerned with how the survivors of a zombpocalypse will rebuild society. It's not concerned with the funny ramifications of a loved one suddenly returning from the dead. No, this quite little movie is about family and the heartbreak which ensues when a family member is terminally ill. If you are into reading movie, it would be very easy to read Maggie as just that -- the infection here can be a stand-in for something like cancer or AIDS, anything where the individual gets sicker and sicker and the hope for any sort of recovery slowly slips away. When Wade brings Maggie home, she is already sick, but she looks fairly normal. However, as the days pass, she begins to manifest the visible symptoms -- her veins become more prominent and her eyes begin to change. She also begins to show other symptoms, such as an enhanced sense of smell. During this, we watch Wade attempt to come to grips with not only the fact that his daughter is changing, but that she must soon go away. He channels his sadness into anger, and challenges the authorities when they come to the farmhouse. As for Maggie, she is trying to deal with this as well. At one point, she visits a group of high-school friends, one of whom is infected as well. Here, we see how the other kids attempt to be nice, but they are clearly uncomfortable and don't know how to act around those who are sick. The focus on the emotional material in Maggie is certainly surprising and refreshing. Even more surprising is Schwarzenegger's performance. Keeping in mind that he will never be Olivier, Arnold really does hold his own here and does a good job of expressing the emotions and frustration which Wade is experiencing. (Is he calling on his own well-publicized family issues to do this?) More importantly, someone here took the time to make sure that we could understand what Arnold was saying. (James Cameron never bothered to do this.) 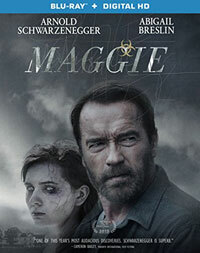 Keep in mind, if you are looking for an action movie, Maggie is not for you. Schwarzenegger's presence should not imply that he's a shotgun toting badass. But, if you want to see a movie which throws out a lot of the cliches and really brings the zombie movie home, in a quiet and heart-breaking way, then Maggie is worth checking out. Maggie doesn't take enough time to explain the family dynamics on Blu-ray Disc courtesy of Lionsgate. The film has been letterboxed at 2.35:1 and the Disc contains an AVC 1080p HD transfer which runs at an average of 36 Mbps. The image is very sharp and clear, showing only a minute amount of grain and no defects from the source materials. The colors are intentionally muted, but they look good, and the image is never overly dark or bright. The level of detail is very good, and the depth is notable, especially in the exterior scenes. The Disc carries a DTS-HD Master Audio 5.1 track which runs at 48 kHz and an average of 3.8 Mbps. The track provides clear dialogue and sound effects. The stereo effects are nicely done, most notably when Maggie and Wade are in the woods. The surround sound effects are also good, as we can hear various sounds coming from within the farmhouse. The subwoofer effects aren't as prevalent, but they do punctuate certain scenes. The Maggie Blu-ray Disc contains an assortment of extras. We begin with an AUDIO COMMENTARY from Director Henry Hobson. "Making Maggie" (18 minutes) is a featurette which focuses on the origins of the film's story and the shooting of the movie. We get comments from Hobson, Writer John Scott 3 (Yes, that's his name) and the cast, as well as on-set footage which looks at the locations and the make-up. Next up are "Interviews" with Hobson (8 minutes), Scott 3 (7 minutes), Schwarzenegger (20 minutes), Breslin (7 minutes), and Richardson (8 minutes) who give their views on the film, their characters, and the movie's themes. The Disc contains one DELETED SCENE which runs about 2 minutes. The final extra is a TRAILER for the film.